This chapter presents propositions about communication that provide a framework by which to judge the communication process. 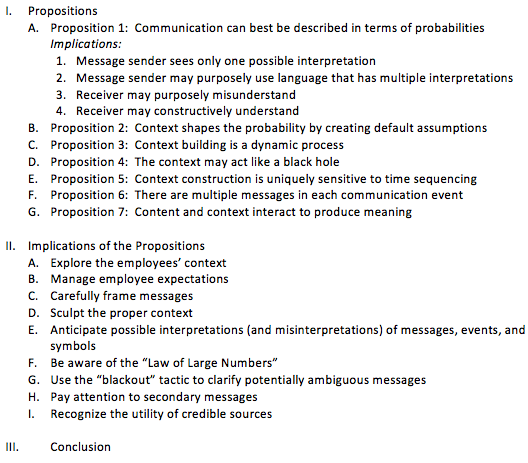 These propositions provide insight into what actually happens in the mind of the sender and receiver and why problems in communication occur. The propositions, such as that there are multiple messages in each communication event and that content and context interact to produce meaning, capture the highly fluid and dynamic nature of the communication process. Meanings are not simply the product of interpersonal relationships, but are influenced by a broader context of an organization’s culture and rules. What can managers do to facilitate this process? Managers must learn to think in terms of possible misinterpretations of their messages. In addition, the more they know about the context in which employees interpret messages, the greater the likelihood that they can accurately predict the probable interpretations. The purpose of this case is to learn how to present a message that effectively manages the probabilities of the communication process. You are the newly appointed “communication advisor” to the president of a large local bank with 15 branch offices. You are in charge of both internal and external communications. From time to time, you are asked to advise the president on major speeches. The president is a highly cerebral person who is risk averse. He runs a conservative operation, steering clear of risky loans and investments. His dedication and attentiveness to detail is legendary. His sole luxury is a 35-foot sailboat that he escapes to on weekends with his family. The problem is that he has to make two presentations in the next month: 1) a major address to the board and the annual “State of the Bank” speech to employees the week after the board meeting. This will be the third straight year the bank has not made its projected financial goals. In previous years, he argued that the results were an aberration. Why this is continuing to happen is a bit unclear. There are a few new (but not serious) competitors and growth in the region, while not great, remains steady. He is frustrated about pinpointing the exact cause of the problem. He expresses much of this in a memo he sent to you. In the back of his mind is a serious concern about his credibility. What advice would you give him? Specify how you would answer the queries in his memo. Provide a rough outline of the two speeches. Discuss how you would present your suggestions to the president. Characterize the situation in terms of the ideas discussed in the chapter. Provide a thorough rationale for your strategic and tactical recommendations. When should I distribute the written documentation for the board meeting? What should be the content of the documentation? When in the presentation should I bring up the financial results? In addition, I’ll be addressing the following issues in the presentation: plans for future expansion, progress with ongoing projects, current economic pressures in our region, competitive pressures and progress on our organization’s corporate values. How should I handle questions in regard to falling short of our financial goals? What are my options for explaining the situation? What sort of proof (examples, statistics, graphs) should I use in the presentation? Second, I’m scheduled to give the annual “State of the Bank” speech to our employees the week after the board meeting. Should this speech be handled differently (see question above)? I’ve always freely shared information with employees about how the bank is doing. I’m wondering if this is the time and place to encourage employees to make suggestions about how to improve our financial situation. What new twists on the notion of “context” does this clip illustrate? Does the clip resonate with the discussion of context in the chapter? If so, how? If not, why not? How could managers make use of the ideas in this clip? What organizational situations does this classic tale remind you of? What does this tale teach us about establishing credibility? In the “real world,” how realistic is the ending of this tale? How could you use these ideas to assess the likely responses of employees to key concepts or initiatives? What do you think would be the most difficult challenge in applying these concepts to communication problems? How could you overcome those difficulties? What value could strategic communicators glean from using the techniques outlined in the clip? Note: This a short video related to finance but the same principles hold for calculating probabilities of the meaning of terms or the interpretations of people. Diagram the various probable meanings of a commonly used word (recall Figure 1.1). Describe an instance where the context significantly shifted the meaning of a phrase. Explain an instance where a key managerial initiative was properly (or improperly) framed. What key chapter principles in the chapter does this video clip illustrate? The “bug” communication problem creeps into the conversation in three different instances. What are the fundamental differences in the way the “bug” problems get resolved? How would an effective manager communicate about a “bug” problem?